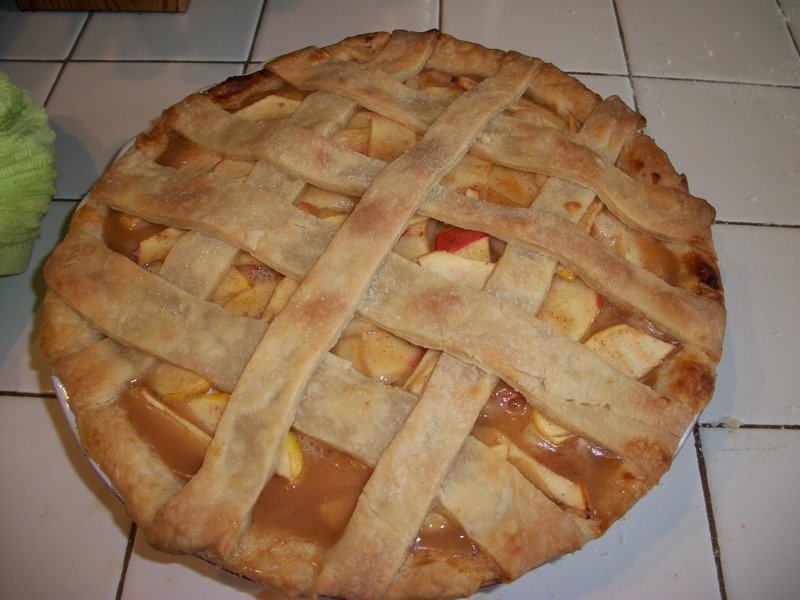 My mom usually makes every component of our Thanksgiving dinner and makes a great vegan apple pie. 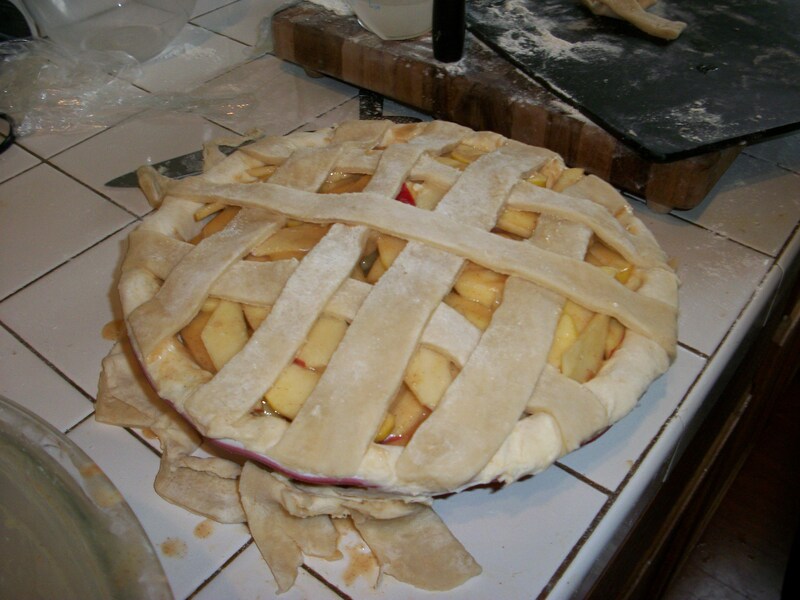 I love baking vegan treats, and I wanted to make up for the fact that two years prior I had attempted to make vegan fried fruit pies, which came apart when I tried to fry them – also my mom was not pleased about the oil spattering everywhere. This recipe looked like a good way to start a new tradition. I’ll put it out there: I have an aversion to mixers and food processors and the like. I would prefer to literally handle my dishes from start to finish, especially when making dough or batter (though I like whipping up smoothies in our blender). The chef was always espousing the values of using the KitchenAid, but I think that’s just because he’s used to working in a restaurant kitchen where everything has to move at double speed. 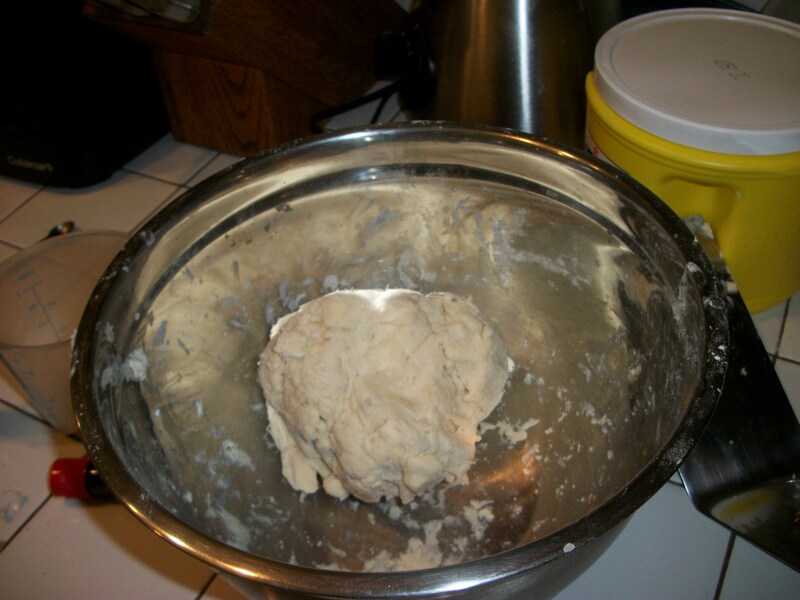 I more enjoy kneading the dough myself. So the chef was nice enough to get me a pastry dough cutter, and my mom provided me with instructions on how to mix the dough by hand. 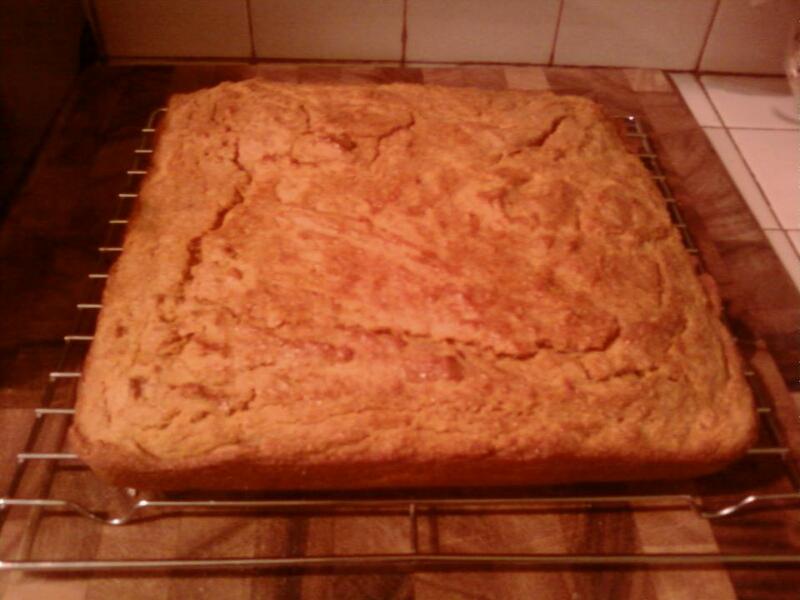 I used cold Bob’s Mill all-purpose white flour, 2 cut-up and well-chilled sticks of Earth Balance, and salt. I separated the dough into two even blobs, wrapped them in plastic wrap and put them in the fridge overnight. 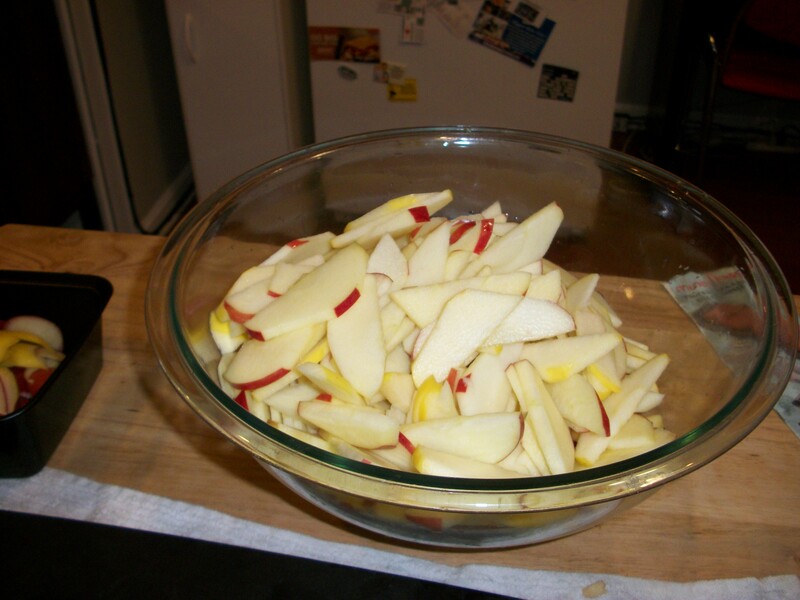 Thanksgiving morning, I got the chef to cut me up some apples – very thin! 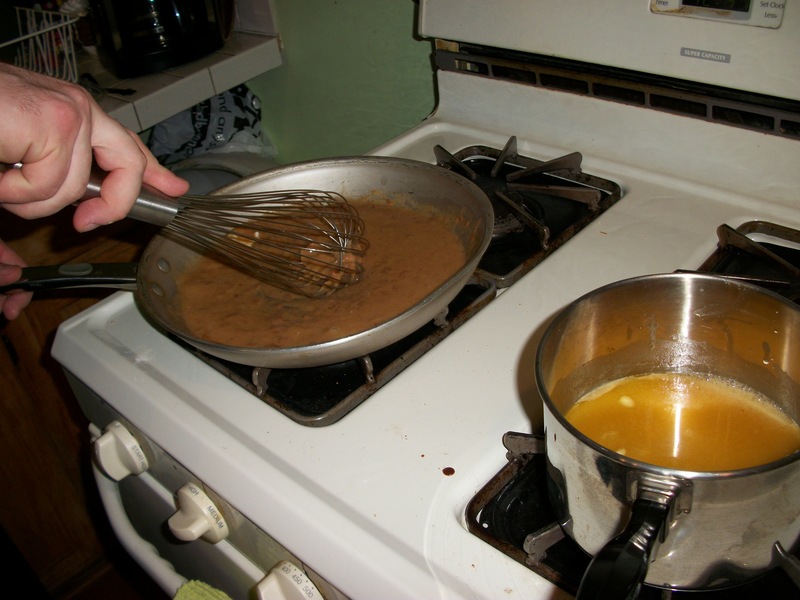 Then we whipped up the filling seasonings and the accompanying caramel sauce. We made the addition Calvados to the filling mixture 😉 I think at this point in the recipe, when I make this again, I would cook the apples a bit in the skillet to soften them up as well. So the chef re-rolled it for me. 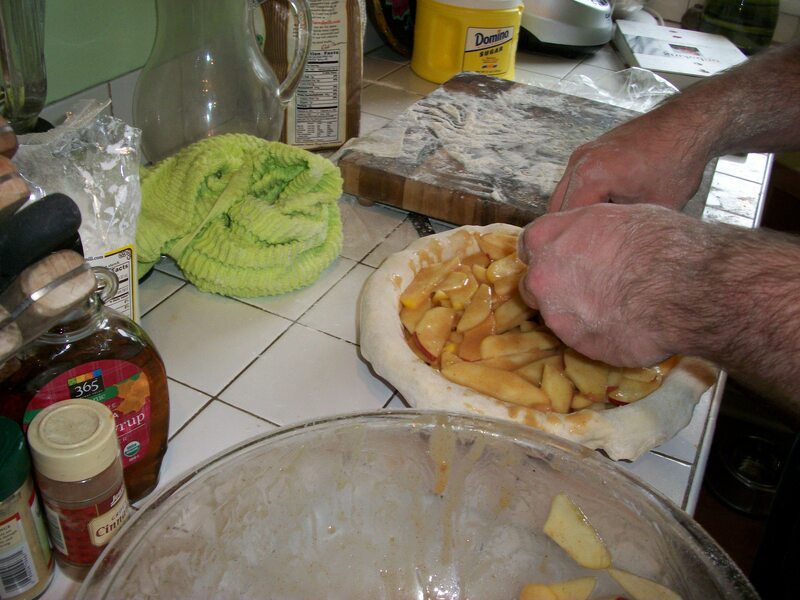 He also arranged the apples into the pie. He cut the lattice strips and I attempted to arrange them. I started weaving them and then kinda gave up. But it doesn’t look too bad! Baked it for 15 mins at 425° and then about 25 mins at 350°. Some of the filling dribbled out while it was in the oven (you can see it at the bottom of the picture here), but it still came out wonderfully! I can’t wait to make it again next year! But I don’t want to put off blogging anymore – I have super stuff to share! Like this here. By “Pornbread” I mean pumpkin cornbread. While it doesn’t have that much pumpkin taste, the canned stuff gives it a perfect consistency. This is the recipe from Vegan Mofo, with my changes in parentheses. 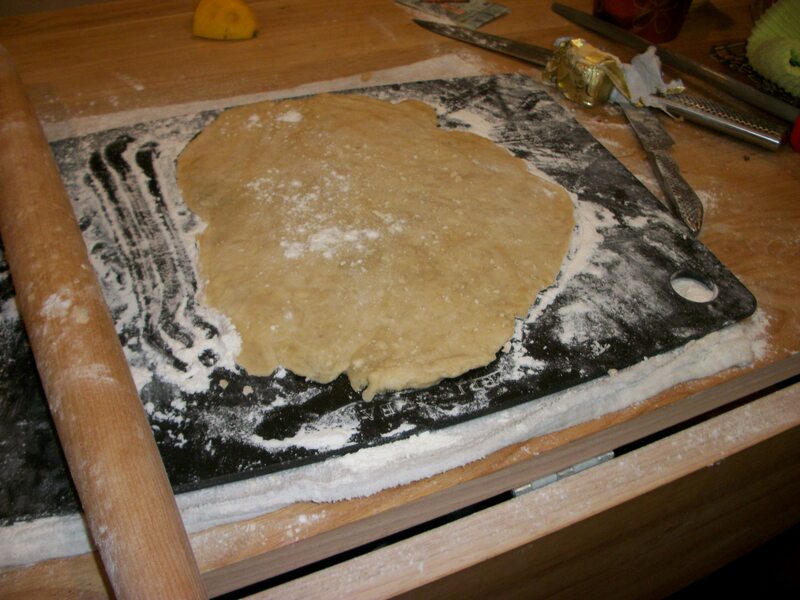 Preheat oven to 375, and oil and flour an 8×8 baking pan. 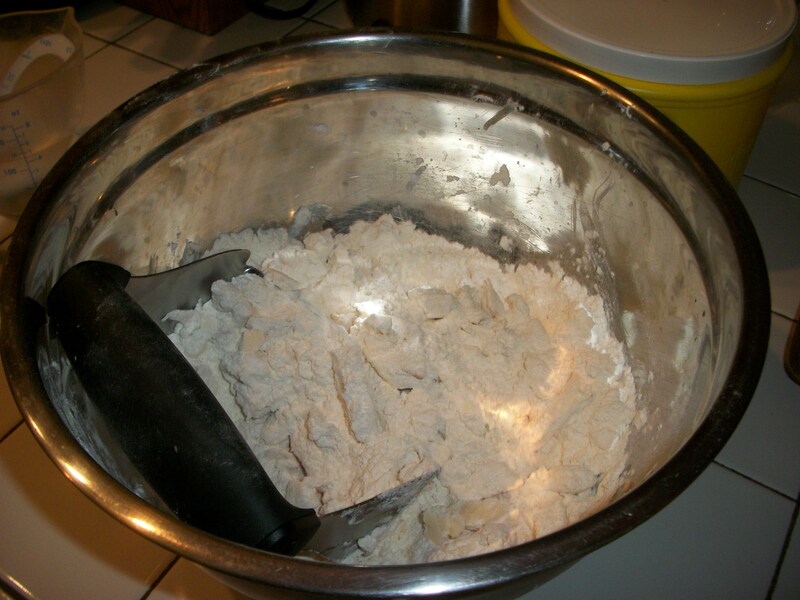 Combine the flour, corn meal, baking powder and soda, and salt in a large bowl. Add the apple cider vinegar to the milk and set aside to curdle for a couple minutes (if you’re using something like rice milk, it won’t curdle but will still work! ), then whisk together with the pumpkin, oil and maple. Add the wet ingredients to the dry and mix with a spatula until just combined. 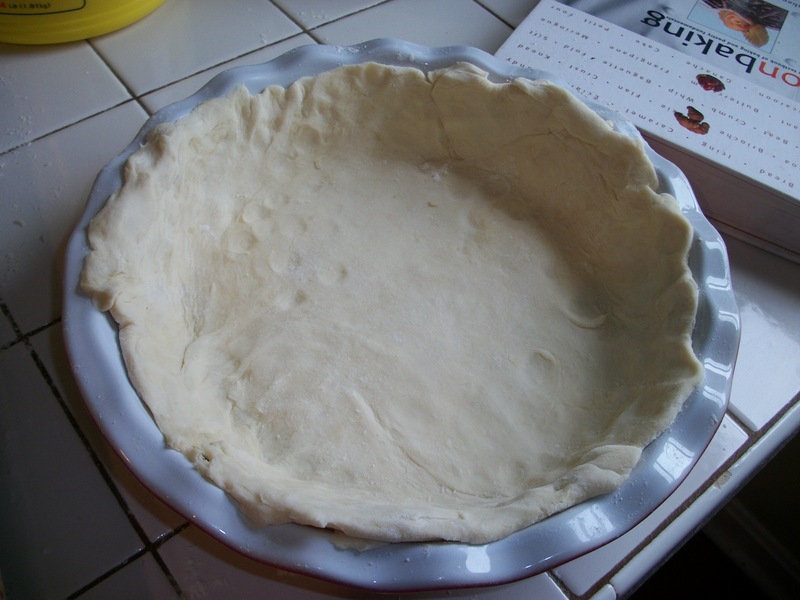 Pour the batter into the prepared baking pan, and bake for 15-20 minutes. Remove from oven and brush top with maple-vanilla mixture. Return to oven for another 15-20 minutes under the bread pulls away from the pan edges and an inserted toothpick comes out clean. Then let cool and serve! *Day after factor* The top of the bread won’t be as crunchy-sweet but the consistency is still great. I’ve had various planned trips out of the country that never ended up happening, partially due to money, but more so due to my parents insistence that I will EAT CHEESE AND DIE if I should ever vacation outside the U.S. and that FOREIGN HOSPITALS DON’T UNDERSTAND ALLERGIES and I WILL DIE. We planned a trip to Cabo several days ago. We booked the trip, it’s all paid for. I didn’t want to tell my parents in order to avoid the reaction above, but after I told Jeremy and his mom that I didn’t feel like telling them about the trip, I started feeling guilty. So I called my mom. She was okay with it! Oh no, wait. 2 hours later she left a frantic message on my voicemail – basically another iteration of the proclamation of doom above, along with a huge guilt trip about how I’m hurting HER feelings by doing something so risky. Jeez mom, can I live my own life? I haven’t talked to her yet, but I will tomorrow. We’ll see how this goes. I want to go to Mexico. Because that’s what I wanted to do in the first place and I won’t have my parents guilt-tripping me into living my life other than how I want to live it. Jeremy is looking at Florida hotels right now, and that is upsetting to me because it feels like I’m accepting defeat in the battle of HOW BEX SHOULD BE ABLE TO LIVE AS AN ADULT. For the pancakes, I cooked up some bacon and coated the bananas in a batter of soynut butter, soy milk, rum, brown sugar and a little cornmeal. Then I fried the bananas in the bacon fat, with a little oil added, then combined that whole mess with the pancake batter. Yummmm.